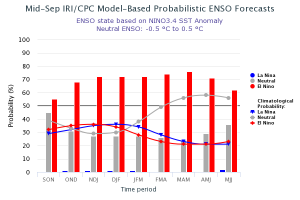 While we are still in ENSO-neutral conditions, NOAA’s Climate Prediction Center is indicating that there is a roughly 70 percent chance of an El Niño occurring by winter. The next update should be out next Thursday. Libbie Johnson of UF/IFAS Extension put together a nice reminder of what impacts farmers in the Southeast, especially northwest Florida and southern Alabama and Georgia, are expected to experience if the El Niño happens. You can read the article at http://nwdistrict.ifas.ufl.edu/phag/2018/10/05/preparing-for-an-el-nino-winter/ or get more details in the factsheet at http://agroclimate.org/wp-content/uploads/2016/03/ENSO-Impacts-southeast.pdf. 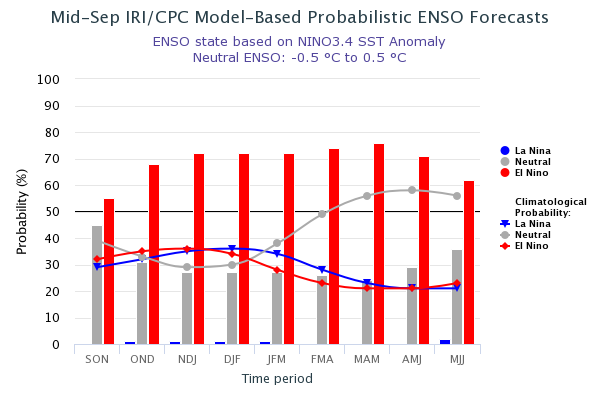 Posted in Climate and Ag in the news, Crops, El Nino and La Nina. Bookmark the permalink.